What is a hygrometer? It’s an instrument that measures relative humidity, or the amount of moisture, in the air. In a moment, we’ll explain how does a hygrometer work, but first, why would you want to know about the relative humidity? We’ll tell you. People use hygrometers to make sure the humidity level in their homes is at a comfortable level. If homes are excessively humid, the air may smell musty, mildew is more likely to develop, and mold is more likely to grow. Mold in the home can cause a number of health problems, including allergic reactions and respiratory disorders, and can also damage the home and its furnishings. If the air is too humid, it usually feels stuffy and just breathing can be uncomfortable, as well. If the air is too dry, though, people may develop dry, itchy skin and painfully chapped lips. Paint on furniture and walls may begin to peel and wooden furniture and musical instruments, like pianos, fiddles, and guitars, can become warped and even ruined. The ideal relative humidity level in a home is typically between 30 and 50 percent, although individual preferences may vary slightly. Using a hygrometer allows homeowners to adjust the humidity in order to be comfortable and to protect their health and their belongings. If your home is too humid, you can use a dehumidifier to bring down the amount of moisture in the air. If the air in your home is too dry, you can use a humidifier to increase the amount of moisture in the air. Both humidifiers and dehumidifiers are affordable small appliances available at many home goods stores. There are a couple different types of hygrometers and they work in different ways. One type of hygrometer uses a human hair to determine the relative humidity in a room. Have you ever noticed how some people experience “bad hair days” or get frizzy hair on very humid days? That’s because when there is more moisture in the air, human hairs actually expand. Hygrometers that use human hairs to measure relative humidity measure how much the hair expands or contracts and uses those measurements to determine the amount of relative humidity in the air. Another type of hygrometer uses two thermometers, one with a dry bulb and one with a wet bulb. The temperature drops as moisture evaporates from the wet bulb and the relative humidity in a room is determined from the difference in temperature between the two thermometers. Both types of hygrometers are equally effective in measuring the relative humidity in an area. What Is a Hygrometer We Recommend? Now that you know how does a hygrometer work and how you might benefit from one, we’d like to tell you what is a hygrometer we recommend. 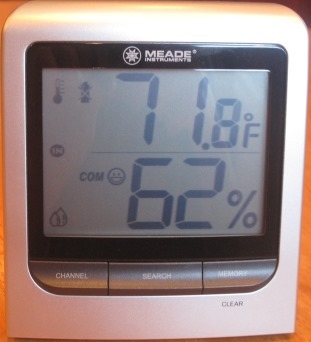 We like the Ambient Weather hygrometer because it also comes with a thermometer to measure room temperature, the large numbers on the console can easily be read from across the room, it comes with an additional sensor so you can monitor the temperature and relative humidity in two different rooms (and you can purchase up to seven additional sensors if you want, which would allow you to monitor the temperature and humidity throughout the home, all from one console), its accurate and affordable. Customers that purchased this hygrometer rated it 4.5 stars out of 5 stars – many said they preferred it to other hygrometers they’d owned in the past. For more information about our preferred hygrometer, to read customer reviews, or to order one for your home, here is a link to it on Amazon.com. 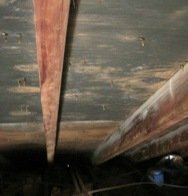 Mold in an attic caused by excessive humidity. The homeowner had their whole house humidifier turned up too high. This could have been prevented with a hygrometer.